This temperature data logger Starter Pack contains everything needed to start logging. 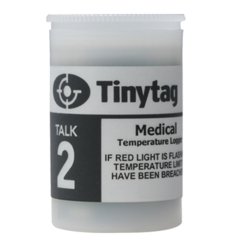 The Talk 2 Medical logger (TK-4014-MED) monitors temperatures from -40 to +85°C using a built-in sensor. It is a simple, cost-effective solution for accurately recording and verifying storage conditions for pharmaceuticals and vaccines in medical fridges and freezers. The unit is compact and lightweight with a flashing red indicator that can be programmed to indicate if temperatures have deviated from a pre-defined range. 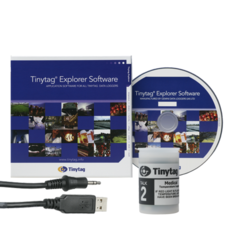 The pack contains: a Talk 2 Medical logger (TK-4014-MED); Tinytag Explorer software (SWCD-0040) and USB offload cable (CAB-0005-USB). The World Health Organisation (WHO) recommendations, on the storage of vaccines and maintenance of the 'cold chain', stipulate that vaccines should be stored and transported according to the manufacturers' recommended temperature range of +2 to +8°C until the point of administration. A small data logger that sits next to the vaccines to monitor temperature provides a straightforward and accurate solution.